I was browsing through various stories this morning and this one amused me – yes, I am easily amused. Apparently, Clement the Cuckoo is missing. So what I hear and who is Clement the Cuckoo ? Clement was one of 5 cuckoos that were tagged in 2011 in Norfolk by the British Trust for Ornithology and Clement seemed to have been flying around Cameroon very happily when he dropped off the radar.The other 4 cuckoos have generally appeared at a later date when they have lost their way, but Clement is feared dead; RIP Clement. 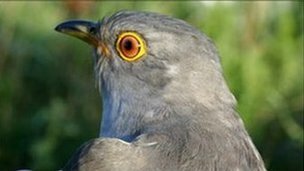 The reason behind tagging cuckoos was to trace their migratory habits as they are in decline in the UK. Clement was the first cuckoo in history to take a western migration route from Europe to Africa via Spain rather than the normal route via Italy. He then made his way from Senegal to The Congo where he joined his four friends in the rainforest. Sadly, cuckoos are not the only bird that is in decline, others include the nightingale, yellow wagtail and turtle dove, but there is an urgency with the cuckoo as their numbers are declining rapidly. Have you heard a cuckoo in recent years? I’m not sure that I have.